Welcome to the international WISE/NIRS newsletter. This newsletter will be published 8-12 times a year. It is not meant as a replacement of our magazine, the Nuclear Monitor, but will focus entirely on anti-nuclear events and tools (actions, meetings, petitions, reports, films, etc.) happening all over the world. We strongly believe in citizen's actions en hope to inspire you all to engage in activities organised by grassroot groups and NGO's all over the globe. Day of Action against nuclear waste dumps, October 15, 2016 in South Australia. 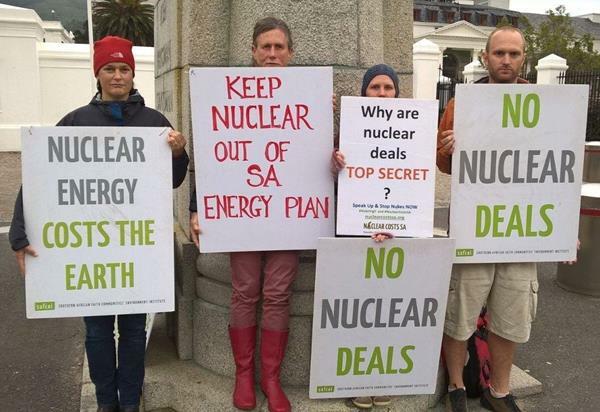 On the 63rd anniversary of the Emu Field atomic bomb tests, take a stand, and join us at Parliament House to say no to nuclear waste dumps in SA. CND Open Conference, October 23, Manchester, UK: New political times, new campaigning methods? Open to the public. Demonstration, October 29, Lingen, Germany. Help stop the transport of nuclear fuel from Lingen and Gronau. You are not alone. Many civic organisations including the unions, social, faith and environmental groups are taking action to oppose new nukes – but so far the government does not appear to be listening. Southern African Faith Communities' Environment Institute (SAFCEI) made a list of things anyone can do. Can't join an event? Take online action! Sign the petition against the construction of two reactors at PAKS, Hungary. By oekostrom AG. Close the Pickering Nuclear Station in 2018. It's the 4th oldest nuclear station in North America - and the seventh oldest in the world. By OCAA. Convince the UK government to abandon Hinkley. By Greenpeace. Petition for the Total Elimination of Nuclear Weapons. By Peace & Planet. Nuclear? Not with my tax money! Not a single euro from the European taxpayers’ money should be spent on dangerous and polluting nuclear power! By Bankwatch. Tell the nations around the world to work together to eliminate the need for nuclear energy! Action material (badges and stickers) with one of the best-known non-commercial logo’s in the world, the Smiling Sun, is available in our webshop in more than 35 languages. Do you have a petition or online action that you want to promote? Get in touch with us! 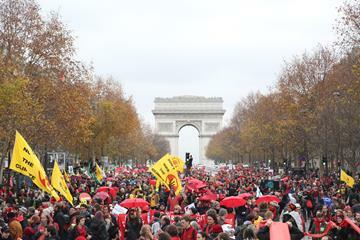 December 2015, COP21, Paris, France. Presenting the award to the winners (EDF), Paris, France. The Nuclear Monitor is the magazine we publish 20 times a year. Well researched with factual information from all corners of the globe. We have done so since 1978. Its the last global magazine on the whole nuclear fuel chain, written from a critical perspective. Subscribers receive it directly. A must-read for all those who work on this issue. Vladimir Slivyak writes about Moscow's latest plans for new reactors, plans that will almost certainly not be realized. Dr Bill Williams writes about the planned uranium and rare earths mine in Greenland. 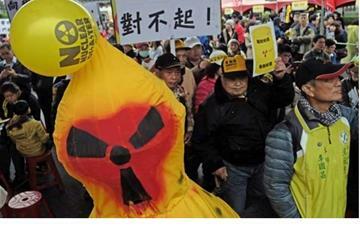 We write about anti-nuclear protests in China, and plans for a large reprocessing plant. Former US Nuclear Regulatory Commission member Peter Bradford writes about the subsidization of nuclear power. Take out a yearly subscription to stay on top of the news in the (anti-) nuclear world. We have special low prices for small groups and individuals. The Nuclear Monitor is also translated into Russian, by WISE Russia (Ecodefense). Find out more about Ecodefense and support their struggle for a more democratic and just energy policy in Russia! 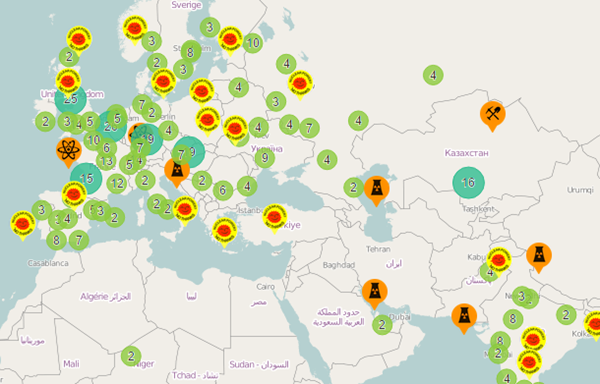 This map on the WISE international website shows all nuclear installations and groups fighting nuclear in the world. Well..., nearly all. We need a little help. Are you a wizz kid with Drupal and creating maps? Or can you help us with information on anti-nuclear groups? Or are you missing any groups or did you spot an error? Help us to improve the map! Please consider supporting our work. Check out the options for donating here.